There is a real joy that’s mustered when the community come together to share a meal. We have now had at least 7 community thanksgiving meals and we love the simplicity of these events. We know celebrating thanksgiving isn’t something we do in the UK but I love that through our fellow American friends, Dave & Renay Banko, we have adopted it. The traditional feasts of turkey, mash potato and green bean casserole mixed with our roast potatoes, veg and stuffing is a wonderful thing! Each year as winter draws near, families begin to ask us when the next thanksgiving meal is happening as they’re eager to book a space for their family and friends. For some, sharing a meal is a far gone experience so it’s a privilege to provide a space for individuals to mix with families, the young and old coming together. 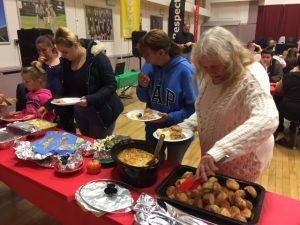 We had around 80 people this year, a time full of food, friendship and fun with thanks to Surrey Hills Radio who provided the music & games. Those who attend bring something to contribute and we take a moment in thanksgiving tradition to share our gratitudes before doing the very British thing of forming orderly queues for food! Eyes widen at the choice and people know to save room, no matter how stuffed, for the vast array of puddings to come! It was a happy and fun time together and we’re hugely grateful to Churches Together and The Leatherhead Community Association for providing the funds and volunteers to make this annual event so good and valued.